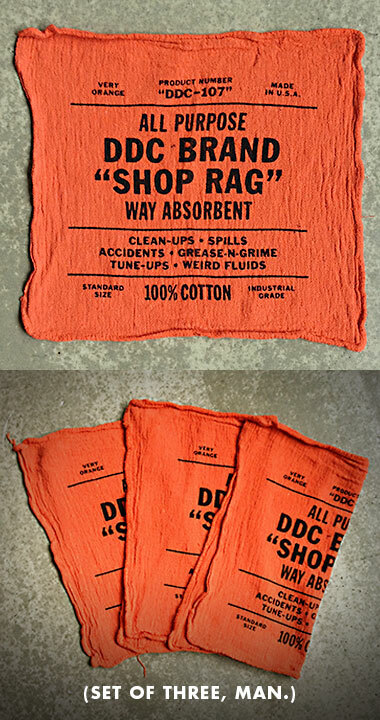 Draplin Design Co.: DDC-107 "Shop Rag Three-Pack"
Finally! A shop rag suitable for the spills, splashes, drool, accidents, tears, bloodbaths, grease, grime and all-out nastiness of the DDC factory floor. All situations. All fluids. Both of the good and evil persuasion. 02. 100% cotton, way-absorbent shop rag. 03. 14” wide and 14” tall. 04. Very orange and hard to lose in some sketchy shop. 05. 1-color DDC branding print by our buddies at Brewery Outfitters. 09. Check yer oil with it.